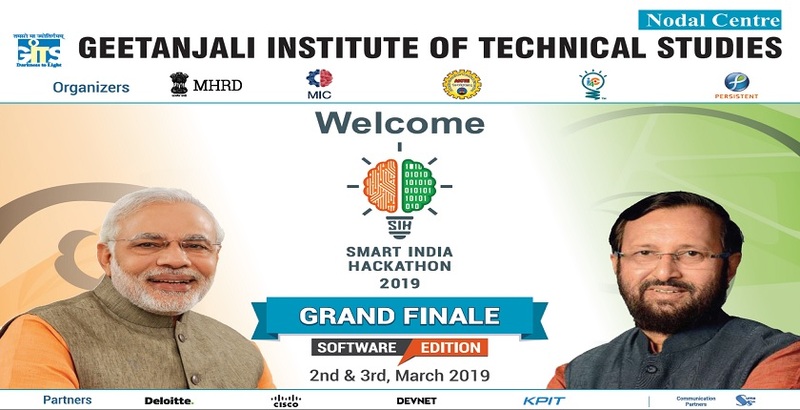 We are proud to announce that Geetanjali Institute of Technical Studies, Udaipur has been nominated as Nodal Center for Hosting Grand Finale of Smart India Hackathon 2019 to be held on 2-3rd March 2019. AICTE New Delhi have confirmed GITS, only third in entire Rajasthan and amongst 49th in India to organize Grand Finale of one of World’s biggest Hackathon of Software Edition. GITS have been given responsibility to host the finale of ITC and AGR knowledge Services problem statements under the Government’s exclusive mega event. Around 28 teams, 200 participants , 56 mentors and more than 30 industrialist from all over the world will be visiting to GITS for this mega event. We wish all the best to entire GITS staff and students to successful execution of the event.